Is The Rs. 1099 Data STV Be A Game Changer For BSNL And A Lesson For Incumbent Operators? Now here comes the best data pack of the year by a telecom operator. BSNL is now offering Rs. 1,099 pack which comes with unlimited data usage for a validity of 30 days. 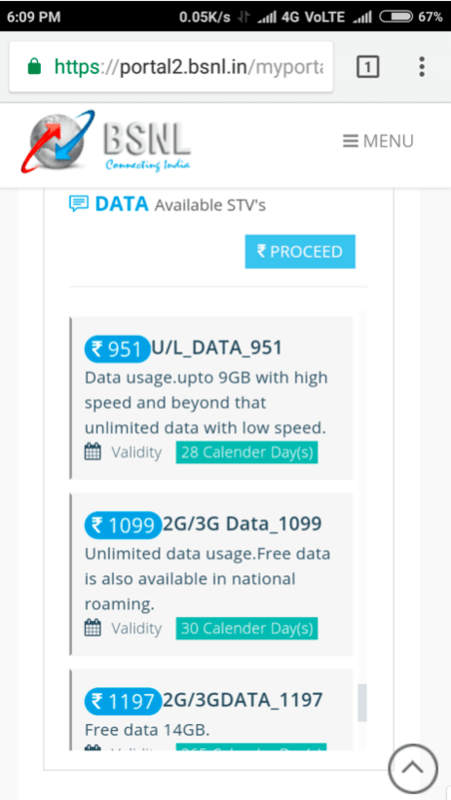 The unlimited data in Rs 1,099 STV has no speed restriction. After 30 days, data will be charged at 3 paise per 10 KB. There is no extra charge for data usage while on national roaming. The Rs.1099 plan by BSNL is one of its kind in recent times by any of the telecom operators. Highly aggressive pricing by Reliance Jio has boosted competition in the sector, leading to the revision of data tariffs and announcement of new offers by every incumbent telecom companies. The plan is for 2G as well as 3G circles, but the absence of free calling is a big disappointment. BSNL has designed above plan with focusing on Jio. Given the network quality of BSNL, it will be a tough call for BSNL’s existing loyal subscribers to opt for any of the plans rolled out by the operator. Although Rs. 1099 is a good plan to entice subscribers. BSNL may be able to entice new subscribers owing to its unlimited data. BSNL will give broadband ISPs a run for their money if it maintains a good network. BSNL is yet to launch its 4G service in India. We hope to see more competitive plans by the incumbent when its 4G service is rolled out pan-India with a better network coverage. The Rs.1099 plan will be a boon for users who are an ardent fan of BSNL and would love to be with BSNL. BSNL is known for not launching recharge plans frequently, but since last few months, this is not the case. BSNL is leaving no stone unturned to give a tight fight to Jio and other incumbent operators. BSNL is on a spree to leave all its competitors behind in launching new plans. BSNL is coming up with new plans every fortnight. Nokia 5 Goes on Sale Starting Today for Rs. 12,899; Should You Purchase It? Reliance Jio has lost its charm since it silently stopped night unlimited data. BSNL is worst network among all. You wont be ablw to download even 100mb per day.